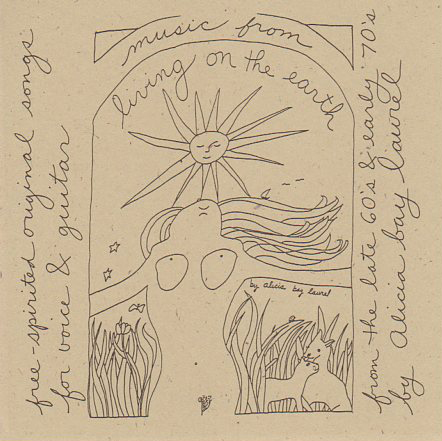 Posted on September 4, 2006 by Alicia Bay Laurel	in Blog. Our team joyously announces its presence at the farmers market. 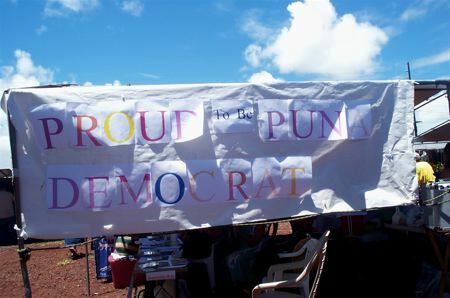 Today I joined my fellow Puna District progressive Democratic Party activists at their booth at the Maku’u Farmers Market. This year I’m based in LA, but in 2004 I was a whirlwind of political do-gooding in Puna, and I am remembered fondly here. 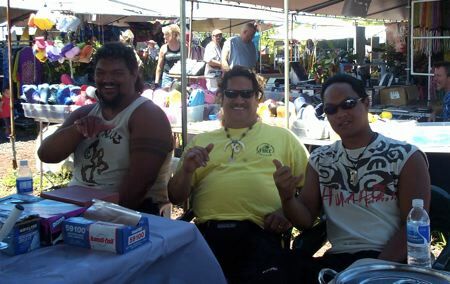 I registered many voters at this market then, presided in my precinct, hosted the platform and the resolution committees at my home, attended the state Democratic Party convention in Honolulu, served as a poll watcher in both the primary and the general elections, and chaired a panel on election fraud at University of Hawaii Hilo with Bill Eger and Milo Clark. 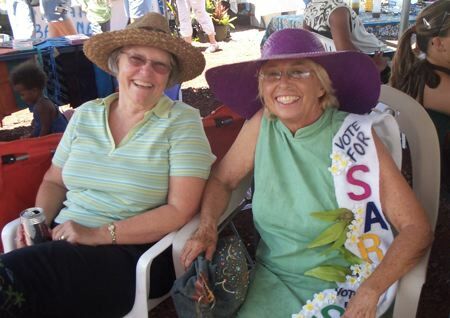 Two of my dear friends: Dr. Andrea Rosanoff, nutritionist and co-author of The Magnesium Factor, is here to register voters and new Democrats, and Sara Burgess, former professor from University of Hawaii Manoa, import business owner, and now progressive candidate for Hawaii State House of Representatives. She got my vote! 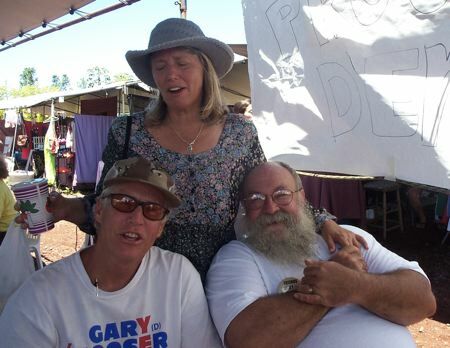 Three more wonderful friends: Rob Culbertson, former head of the Sierra Club on Kaua’i and still an environmental activist and progressive political activist on the Big Island, Roxanne Lawson, who has worked with Puppets for Peace, and as an international peace teacher, and Steve Sparks, sculptor, builder and husband of Andrea Rosanoff. Rob and Roxanne are working on progressive Gary Hooser’s campaign for Hawaii’s second district seat in US Congress; Steve is registering voters and Democrats. In the next booth to ours was a family of Tahitians, happily listening to recorded Tahitian music and eating Tahitian food. They graciously posed for a photo.